Today’s post concerns a popular motivational quote that is often misattributed and misworded. Most sources with the correct attribution cite Sceptical Essays, published in 1928, as the work in which to find the quote. It is a collection of Russell’s essays and includes his 1922 speech “Free Thought and Official Propaganda” as an essay. This speech was also published in 1922 as a book. While it is not incorrect to cite Sceptical Essays as the source, I prefer to use the name of the speech “Free Thought and Official Propaganda” as it is more specific and is the work in which the quote originated. Note the wording in the second misquote. It appears that somewhere along the line, someone realized this quote is from Bertrand Russell and corrected the name attribution but did not correct the wording. And as we have learned from all my previous posts, the quote virus took over, and this new version propagated. This is why there are two versions of the quote attributed to Russell. 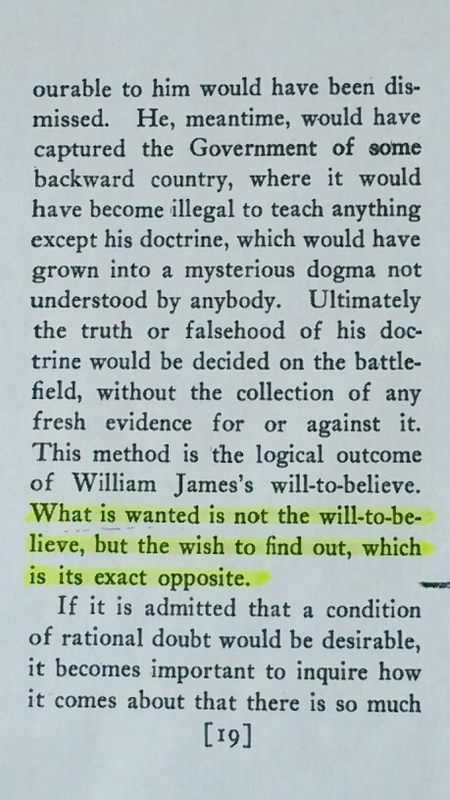 Here is the correct quote found in “Free Thought and Official Propaganda” by Bertrand Russell. 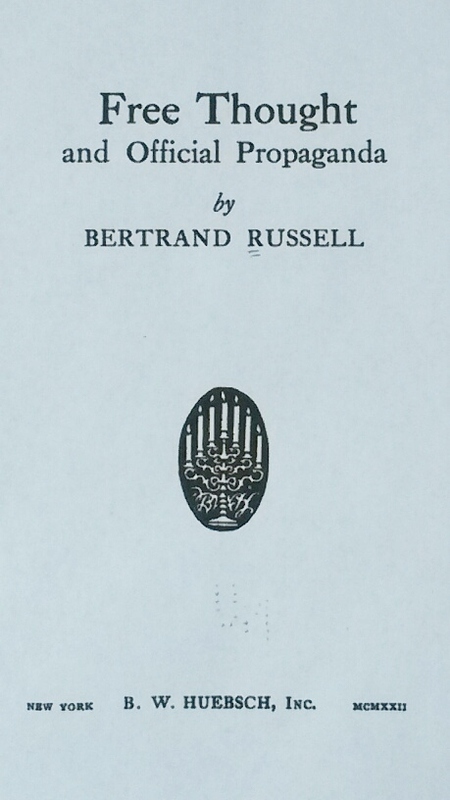 Here is the title page of “Free Thought and Official Propaganda” by Bertrand Russell. After surveying seventy-eight websites featuring the misattributed quote, I found the following trends. Once again, the statistics tell the same story. It is the websites dedicated to quotes only that are the major source of this misquote. Coming in second place are websites that feature extensive quote collections in addition to other topics. Even though it would seem that a website which specializes in quotes would be the best resource for quotes, the statistics clearly indicate otherwise. Sadly, tied for fourth place are educational institutions. This shows how powerful the quote virus is. Even the hallowed halls of academia are not immune to its infection. I came across an addiction information website that attributes the quote to William Shakespeare. I thought this was odd as I had never seen this attribution before. So I did a little bit of research to see if I could find where this information may have originated. The possible answer is a book of quotes published in 2002 which features Russell’s quote just prior to a Shakespeare quote. I am guessing the addiction website administrator read it and misunderstood which quote went with which author and posted it erroneously on the website. Yes, I realize there’s a joke here, but I can’t bring myself to write it, so we will just have to silently chuckle to ourselves. Any way, this may sound like an outlandish conclusion, but based on how the quote virus works, it is a definite possibility. Who knows—this could be the beginning of a new viral strain and within a year or two, we may see a third version of the quote commonly attributed to Shakespeare. I found today’s misquote in a quote book published in 2014. Much like quote websites, just because a book specializes in quotes, does not mean it is a reliable resource. Unfortunately, most modern quote books are compilations of previous quote books which are compilations of previous quote books and so on and so forth. Additionally, most modern quote books also contain compilations of quotes found on quote websites. Because of all this duplication, miswording and misattributions are propagated ad infinitum. As I’ve mentioned before, a quote that only provides a name attribution is not reliable. It should also include the title of the work in which the quote is found as well as relevant information such as chapter, act, scene, line number, stanza, etc. It is so disheartening to see educational institutions propagating misquotes. One of the more disturbing finds is a school librarian who uses the misattributed quote on her library web page. I also found another school’s English department using it on their web page. And most egregious of all is a university professor and poetry editor of a national literary journal who uses it in one of his books. I discovered a religious website featuring today’s misquote. The irony is that the true originator, Bertrand Russell, was not a fan of religion. He not only considered himself agnostic and atheist but he wrote many essays on the topic. As with most other popular quotes, today’s misattributed quote is available for purchase. I came across a website selling the misquote on t-shirts for $28.01. I found another one offering posters for $12.20. The bonus is that you get two for the price of one—misattributed AND misworded. What a deal! Only you, dear reader, can help exterminate the quote virus. Like a physiological virus, the best weapons are education and prevention. You can educate by sharing the knowledge. Share this post with your family and friends or “like” my Facebook fan page or follow me on Twitter. You can prevent infection by never using a quote from a quote website and never trusting a quote that does not include detailed source information. The name attribution alone is not sufficient. For a complete list of prevention tips, visit my “What You Can Do” page.